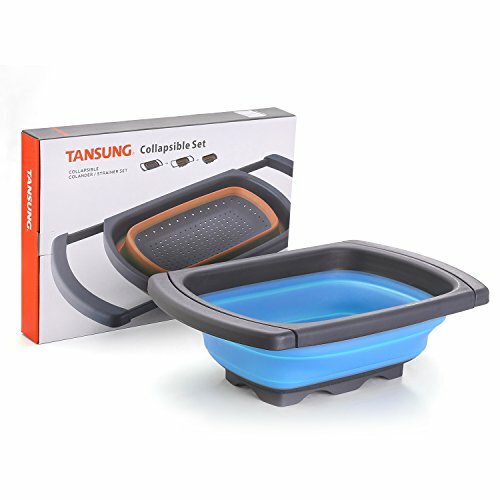 Collapsible Over Sink Colander with Handles, Food-Grade kitchen Strainer, Capacity of 6 quart, Space-Saver Folding Strainer Colander, Dishwasher Safe (blue) by TANSUNG at Mystic Oaks. Hurry! Limited time offer. Offer valid only while supplies last. Most popular gift idea for kitchen enthusiast: Do you need useful gifts for the family, A beautifully packaged birthday Gift for Mom or Dad, They will love this amazing treats. 5． Warranty： We give our customer 18 months' warranty with friendly customer service. 30days' unconditional replacement and 24/7 email support for your peace of mind. If you have any questions about this product by TANSUNG, contact us by completing and submitting the form below. If you are looking for a specif part number, please include it with your message.